IJC2016 will be held in Tecnun - University of Navarra, Donostia-San Sebastian (Spain) on July 13-15 of 2016. Printed edition of Journal of Industrial Engineering and Management Vol 8, No.5 on Lulu. During 2014 all authors that have published in JIEM had been asked to answer a short questionnaire about the quality of publication process. Printed edition of Journal of Industrial Engineering and Management Vol 8, No.4 on Lulu. Printed edition of Journal of Industrial Engineering and Management Vol 8, No.3 on Lulu. The ERIH PLUS listing of the journal is available clicking here. Printed edition of Journal of Industrial Engineering and Management Vol 8, No.1 on Lulu. Printed edition of Journal of Industrial Engineering and Management Vol 7, No.5 on Lulu. Printed edition of Journal of Industrial Engineering and Management Vol 7, No.4 on Lulu. Printed edition of Journal of Industrial Engineering and Management Vol 7, No.3 on Lulu. Printed edition of Journal of Industrial Engineering and Management Vol 7, No. 2 on Lulu. Printed edition of Journal of Industrial Engineering and Management Vol 7, No. 1 on Lulu. During 2013 all authors that have published in JIEM had been asked to answer a short questionnaire about the quality of publication process. Printed edition of Journal of Industrial Engineering and Management Vol 6, No. 4 on Lulu. JIEM aims to facilitate and enhance research and professional career of our authors, implementing a new model of Dynamic Journal Issue designed to reduce the time of publishing those articles that meet the standards of the journal. Printed edition of Journal of Industrial Engineering and Management Vol 6, No. 3 on Lulu. Printed edition of Journal of Industrial Engineering and Management Vol 6, No. 2 on Lulu. Printed edition of Journal of Industrial Engineering and Management Vol 6, No. 1 on Lulu. 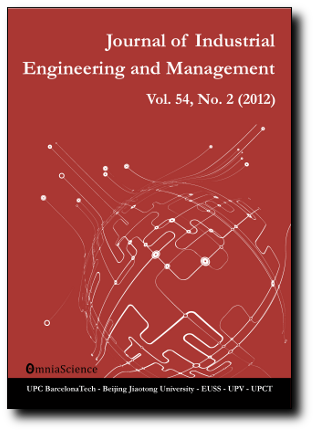 Printed edition of Journal of Industrial Engineering and Management Vol 5, No. 2 on Lulu. ICIR, of the prestigious Beijing Jiaotong University has become an OmniaScience partner for the scientific and editorial management of the Journal of Industrial Engineering and Management.